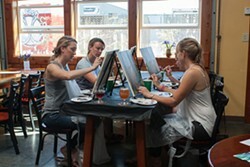 A Sunday afternoon “Sip and Paint” turns Redwood Curtain Brewing Co. into an improvised art studio. In a far corner of Redwood Curtain Brewing Co., four women face four canvases. In front of them are dollops of paint on paper-plate palettes. Beside them are Redwood Curtain sour beers. 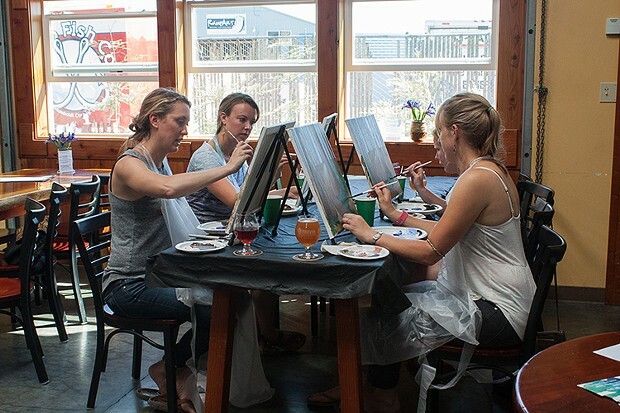 This is Happy Trees Sip and Paint, a two-hour painting class enlivened with good beer. It is run by Emily Michaels, who provides pre-sketched canvases, pre-selected paints and a steady stream of reassuring instruction. "There is no right or wrong here," she tells the painters. "So, do you." Michaels tries to make that easy. She has draped the worktables with black plastic and set out plastic aprons for each beer-loving artist. She has prepared recommended colors — yes, you can change them — along with brushes, water and mixing palettes. She has drawn a forest scene in pencil on each otherwise bare, white canvas. 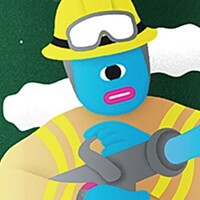 Yes, you can change the scene, too. Taking up the challenge, Rachel Carlton begins sketching her dog "Tiger" among the trees. She studies her phone, looks from Tiger's picture to the canvas and frowns. The body looks wrong. Carlton erases and starts again, this time with Tiger's head peeking out from behind a tree. She turns to a friend and smiles. Much better. Carlton and three of her friends have gotten together on this Sunday afternoon to give beer-enhanced painting a try. Outside, it's tank-top sunny. Inside, the often-packed brewery is nearly empty. Two silver-haired men chat over their glasses. A younger couple leans toward each other like flowers to sunlight. The painters listen intently. "I'm going to be walking you through each step," Michaels says, explaining the layering that will slowly make a scene, starting with sky and ground. Thin the colors with enough water, she says, and the sketch underneath should show through. If a brushstroke goes awry, no problem. Just let it dry and paint right over it. "That's the great thing about acrylic paint. You can't mess up. It's almost impossible," Michaels says. She pauses, then bursts out in a smile that lights her whole face. "Almost." Another pause. "I've done it." Michaels, who is finishing up an environmental studies degree at Humboldt State University, started Happy Trees Sip and Paint partly to build more painting time into her own life. She modeled it after businesses she worked with in Sacramento: one that taught painting in wineries, another that that held BYOB paint nights in an art gallery. Scores of similar paint parties are filling canvases nationwide, combining alcohol, art and playful names: Pint and Paint, Paint Night Out, Color Mi Vino, Canvas and Cabernet. Lost Coast Brewing in Eureka has sometimes offered paint nights and in Arcata there are BYOB painting parties with cupcakes on the side. The Redwood Curtain event began earlier this year, generally from 2 to 4 p.m. every fourth Sunday. In October, Michaels plans two Sip and Paint gatherings, creating an elk on Oct. 1 and an owl on Oct. 29. To enroll, email her at happytreesipandpaint@gmail.com. At her late August Sip and Paint, the taproom space seems tailor made for art. Deep blue irises dot the tabletops. Sunlight slants across wooden tables and the polished concrete floor. Step by step, Michaels keeps her pointers coming. How to put a forest path partly in light, partly in shadow. How to add texture to tree trunks. How to create shrubbery with dry-brush tapping. How to make slanting rays of sunshine — so easily done, in Michaels' demo, that a guy watching near me mutters "holy crap" to a friend. Midway through, the bar is getting busier. A soft thrum of conversation mixes with recorded rap. The scent of fish and chips wafts from the next table. A woman walks toward the painting group, saying "I wish I had known about this," before she picks up one of Happy Trees' cards. A family settles in to watch the class unfold, critiquing softly — they don't love the perspective of the starting sketch. No one is making Monets here, but Michaels never stops encouraging. "It's a tree trunk — don't be afraid of the texture if you have some blobby paint going on." "These are trees; there's no such thing as a straight line." And, perhaps most importantly: "We're going to let this dry a bit, so you might want to take some swigs." On paper, this class lasts two hours but Michaels stays late, answering questions and helping each of the four women add their own finishing touches. A tree stump here, another dog there — and empty glasses all around. Monday, Oct. 2 – Eel River Brewing releases its 22nd Anniversary Ale, a barleywine style beer, in bottles and on draft at its taproom. These memorable anniversary beers age well, so snag some extra while you can. Saturday, Oct. 7 – One of the beer world's best storytellers, Charlie Bamforth, who is also a UC Davis professor of malting and brewing, presides over beer and cheese pairings from 6 to 8 p.m. at the Sequoia Conference Center in Eureka. Benefits Arcata High School's Career and College Center ($40). Wednesday, Oct. 11 – Dig into German food and five seasonal fall beers in an Oktoberfest buffet and beer pairing from 6 to 9 p.m. at HumBrews in Arcata ($35 advance, $40 door). Saturday, Oct. 14 – Sample beer and cider for a good cause at Hoptoberfest, benefitting Blue Lake schools with brews from about 20 local and regional breweries. Taps open at 1 p.m., and student steel drums kick off the music at Perigot Park in Blue Lake ($30 advance, $35 door, $5 non-drinkers). Saturday, Oct. 21 – German ales and lagers take center stage at Redwood Curtain Brewing Co.'s daylong Fall Fever Bierfest in Arcata. With food from the LoCo Fish Truck, because what German beer celebration in California is complete without fish tacos? Wednesday, Oct. 25 – Mad River Brewing Co. brew master Dylan Schatz leads an archival tasting – three different years of John Barleycorn Barleywine – beginning at 6 p.m. at The Boardroom in Redwood Acres, Eureka. Saturday, Nov. 4 – The Humboldt Homebrewers celebrate Learn to Homebrew Day with a homebrewing workshop starting at 10 a.m. at the Humboldt Beer Works supply store in Eureka. Saturday, Nov. 11 – The beer never gets weirder than at Strangebrew, the "can you top this" playground for local brewers and homebrewers. 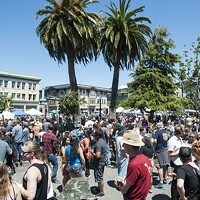 Humboldt Homebrewers and Southside Mike's barbecue are both scheduled to return for this year's fest, starting at 5:30 p.m. at the Eureka Theater. Tickets, benefitting Eureka Theater, are $35 advance, $40 door. Sunday, Nov. 12 – If your beer-making urges were whetted on Learn to Homebrew day, you might be ready for intermediate homebrewing, taught by Humboldt Regeneration's Jacob Pressey. 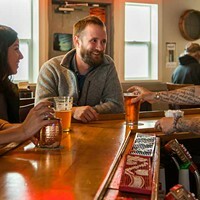 The one-day seminar, from 11 a.m. to 4 p.m., covers advanced techniques and all-grain brewing. Sign up through HSU's Center Activities ($50, $45 HSU students). Carrie Peyton Dahlberg is certain that anything she tried to paint would turn out better with beer. Write her at beerstainednotebook@gmail.com.